BOX TOPS ARE POPPING UP EVERYWHERE! Clip and Save your Box Tops to send in with your student during the SES Box Tops Contest. Ask friends, neighbors, and other family members to save them for you as well. The class that brings in the most Box Tops will win a popcorn and movie party! Grade level class winners will each get a popcorn bucket. Florence Community PTA Wants You! Florence Community PTA is working towards reaching their 2018-19 membership goal of 197 members—we need your help! If we reach this goal by March 1st, we will receive a prize from the Oregon PTA. More importantly, we will have nearly 200 people who have shown their support for local students! At just $11 per year, our membership dues are an easy way to way to support kids, families, and education in our community. Even if you don’t have time to volunteer for PTA activities, we still invite you to become a member. Meetings are held on the second Tuesday of each month at 4:30 pm in the Siuslaw Middle School Commons. The meetings are open to the public and everyone is welcome to attend. “You don't have to be a teacher or have a child in the school system to become a member here,” said Alex Selig, PTA President. “Everyone is welcome to join our PTA, including businesses and even out of town relatives who want to support students in Florence.” The Florence Community Parent Teacher Association is a 501(c)(3) nonprofit which serves all of the public schools in the Siuslaw School District. Current and prospective members are encouraged to check out the Florence Community PTA Facebook page and website, www.florencepta.org, for events, updates and information. Email FlorenceCommunityPTA@yahoo.com for questions. The Florence Community PTA has had a successful and busy Fall, providing welcome back goodies for staff at each of the Siuslaw schools, meals for teachers on parent/teacher conference night, and programs for students. The annual Box Tops Civil War Challenge was held in November at Siuslaw Middle School. Students and staff clipped and saved Box Tops to bring in and use them to "vote" for their favorite Oregon Civil War team, the Beavers or the Ducks. Teams "scored" points as Box Tops added up. In the end, the Beavers team won, brining in the most Box Tops. Florence PTA earns 10 cents for each Box Top turned in. The next Box Tops challenge is coming up soon at Siuslaw Elementary School. You can find more information about the Box Tops program at https://www.boxtops4education.com/. Call Diane McCalmont(541-997-1854) if you have questions about collections at Siuslaw schools. In December, the PTA held their 2nd annual Breakfast with Santa at the Cross Road church in Florence. Cooks were kept busy in the kitchen flipping pancakes and preparing breakfasts for kids and families in attendance. Nearly 300 breakfasts were served to families from the Florence community. Santa and Mrs. Claus met with kids (big and small) on their laps and listened to Christmas wishes. Crystal Osburn coordinated the event, with help from many volunteers in the kitchen, servers, greeters, and at the raffle table. Kaye Wheeler set up the bake sale, which provided plates full of holiday treats. It's never too late to join the local PTA. Members can get as involved as they like, from attending monthly meetings to volunteering with programs and projects like the Talent Show, Teacher & Staff Appreciation, Publicity, high school sutdent scholarship committee, teacher and staff grants, and many more possibilities. However, joining the Florence PTA, without committing a big amount of time, is a great way to show support for students, families, and education in our community. Membership forms are available at each one of the Siuslaw schools or on the PTA website at www.florencepta.org. Florence PTA also welcomes Business Sponsors. Contact Alex Selig, Courtney Pitcher, Jamie Gorder, or Diane McCalmont for more information. Florence Community PTA held its first meeting of the 2015-16 school year on September 22 at the Siuslaw Elementary School Library. Ethel Angal, Siuslaw School District Superintendent, was the guest speaker. She reported that there is a district wide focus on attendance this year. Posters and banners are in the works that will promote good attendance. Angal encouraged parents and school staff to read about the importance of attendance at attendanceworks.org. Other highlights of the meeting included three grant funds awards for school programs in music and art at the high school and elementary school. Members voted to add Susy Lacer to this year’s Board of Directors in the capacity of secretary. Board president Diane McCalmont, read a letter from National PTA’s President, Laura M. Bay, congratulating Florence Community PTA and Siuslaw Elementary School on the recent recognition of becoming a School of Excellence. This award was given to only two schools in Oregon this year. School of Excellence pins were presented to committee members Michael Harklerode, Susy Lacer, Jennifer Wilks, Alice Burns, and Diane McCalmont. PTA started off the school year by showing support for teachers and staff with “grab and go” goodie baskets in each of the staff lounges, including the bus barn and district office, on the first day of school. Plans are in the works for other programs and events throughout this school year for families, students, and staff. Florence Community PTA invites everyone to join them in supporting quality education and activities for students. Anyone can join PTA: moms & dads, aunts & uncles, grandmas & grandpas, foster parents, high school students, teachers & staff, and community members. If interested in volunteering with the Florence PTA, there are opportunities awaiting your expertise and passion. Individual membership dues are just $11 and are 100% tax deductible. PTA also welcomes Business Sponsors for an annual fee of $25. Businesses will receive a PTA window cling to display at their location, as well as be recognized in our monthly newsletter and at our events and meetings. Call Diane at 541-997-1854 for more information. Membership and Business Sponsor forms can be downloaded from our website at florencepta.org. The Florence Community PTA is an award winning organization that works to improve the education, health, safety and well-being of children and youth in our community. This PTA serves all of the schools in the Siuslaw School District, Kindergarten – grade 12. 2015-16 Board Members are Diane McCalmont, president; Mike Kilgore, vice president; Jennifer Wilks, treasurer; and Susy Lacer, secretary. Meetings are scheduled for the third Tuesday of each month, 4:00 pm, in the Siuslaw Elementary School library. Refreshments and childcare are provided. Watch for the annual PTA Fall Fitness Fair coming in November. This program promotes health, exercise, nutrition, and safety for people of all ages. It is a free community event. If you are interested in participating or would like to help, contact Alice Burns at Siuslaw Middle School. You can also show your support on the Florence Community PTA’s Facebook page. Visit the website at florencepta.org. It includes links to the Oregon PTA and National PTA, as well as articles and information about what’s going on in the Florence PTA. You can also download a membership or business sponsor form to complete and mail in. The first PTA meeting of the new school year featured Siuslaw Elementary School Principal Michael Harklerode who spoke on the implementation of Common Core and what it means for our students. Adopted by over 45 states in the U.S., the Common Core State Standards are a set of shared K-12 learning expectations for students in English Language Arts and Literacy and Mathematics. While the new standards are similar in ways to Oregon's current standards, some content has been shifted and the level of rigor has increased to ensure college and career readiness at the end of high school. Beginning in 2014-2015, students will no longer take the OAKS exam and will take the Smarter Balanced Assessment instead. These materials came from the Oregon Department of Education and more resources can be found on their website, www.ode.state.or.us/go/commoncore. National PTA also has many great resources for understanding Common Core and can be found on their website, www.pta.org/advocacy. The next PTA meeting will be held October 14 at 5:30 pm at the elementary school library and will feature Ethel Angal, Siuslaw School District Superintendent. Everyone is welcome, refreshments are provided, and child care is available. Congratulations to our incoming officers! 2014 BOOK FAIR DINER HUGE SUCCESS! PTA JOINS FRED MEYER REWARDS PROGRAM. Fred Meyer's Community Rewards program allows customers to now earn donations for the Florence Community PTA just by shopping with their Rewards Card. Fred Meyer plans to donate $2.5 million to nonprofits in Alaska, Idaho, Oregon and Washington in 2014 through this new program. The store will make a donation to the PTA based on the accumulated spending of customers using their linked Rewards Card to the nonprofit. Enrolling is an easy process that's clearly outlined on the website www.fredmeyer.com/ communityrewards. Register your card and link it to support: Florence Community PTA NPO number 85501 Customers can begin earning donations for the Florence PTA when they shop at Fred Meyer using their linked Rewards Card. If you don't have a Fred Meyer Rewards Card, you can sign up for one at the Customer Service Desk of any Fred Meyer store. Get your friends and relatives from other areas to also sign up to support the Florence Community PTA. They don't have to live and shop at this Fred Meyer. ANNUAL FLORENCE COMMUNITY PTA TALENT SHOW SHAKES UP FEC. The ever-popular annual PTA Talent Show was the main event at the Florence Events Center on the evenings of March 13 and 14. Families and friends turned out in full force to watch the awesome acts performed by Siuslaw Elementary School students. Members of the local Cub and Boy Scouts started off the show with a presentation of the flags, followed by the Pledge of Allegiance. Since there were so many acts presented this year, the talent was divided between Thursday and Friday nights. 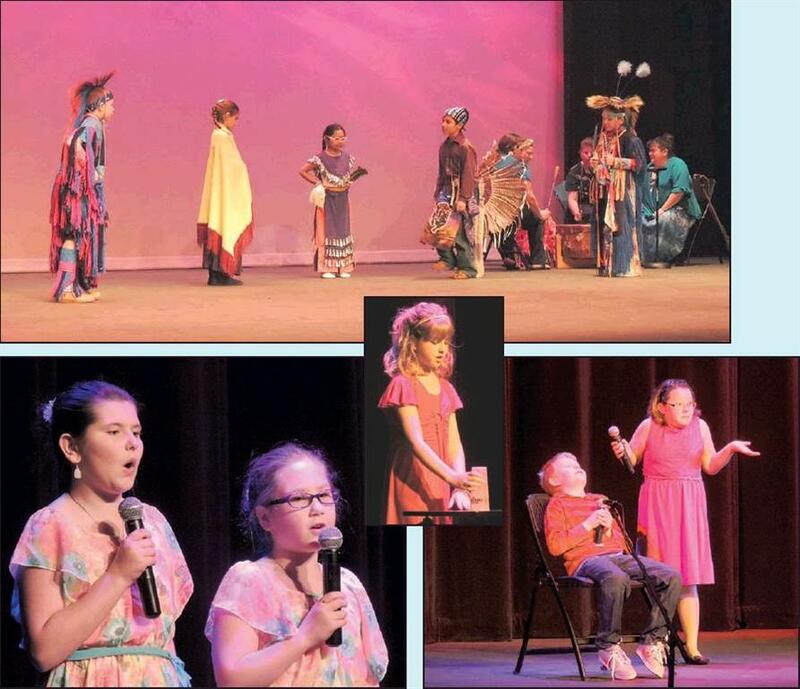 Entertainment included instrumental musicians, gymnasts, vocalists, comedians, Indian Education native drumming and dancing, and the elementary school's own choir. Michael Harklerode, principal at the elementary school, emceed the show. Each evening ended with cookies and juice served in the lobby by Red Rose Catering. In charge of the event each year is Alice Burns. Her faithful helpers this year were: Natalie Goldsmith and Margot Fleming as backstage hands; Nevin Goldsmith, program distribution; Jenny Hodulik, Alice Holden, Diane McCalmont and Heather Goldsmith, tickets; and Jennifer Wilks, program design. The Friends of the FEC provided a grant for use of the facilities for both nights, and FEC staff, Margaret, Buck and Dino were on hand to make sure things went smoothly. Two $500.00 (as funds are available) scholarships per year are given to graduating seniors (Siuslaw High School or home-schooled in Florence) intending to pursue a teaching career. Student must attend an accredited college, community or university. Student must demonstrate academic potential or achievement, leadership and character. The following items must accompany the application: a financial statement, an official transcript of grades, a resume, and at least one letter of recommendation. Although students of Florence PTA members are encouraged to apply, it is not a requirement. Applications are available through the Siuslaw High School Counselor’s Office. Deadline for applications is April 15th. Scholarship recipient will be selected by May 5th. Download the application here. Fitness, nutrition, and safety were emphasized topics at the PTA’s annual Fall Fitness Fair held Saturday, Nov. 16th at Siuslaw Middle School. Over 100 people attended off and on throughout the day, to participate in fun fitness activities, snack on healthy foods, and learn about healthy lifestyles and nutrition. November is National PTA’s Healthy Lifestyles month, a perfect time of year to promote getting up off the couch and finding positive activities to get involved in. The local PTA sponsors this free event to encourage families in our community to think about health and fitness. Free handouts, information, and interactive learning were available from 10 local organizations. Groups represented included the Boys & Girls Club, with basketball drills and games conducted by Eric Tanikawa and Jeff Kelly; Coastal Fitness; Children’s Repertory of Oregon Workshops (C.R.O.W.) and Dance; Indian Education; Dr. Ian Jarman with Café of Life; Peace Health; Siuslaw Area Partnership to Prevent Substance Abuse (SAPPSA); Siuslaw Fire Department, Siuslaw High School Rally Girls, and PTA. During the day, fair-goers entered a raffle to win one of many fitness prizes, donated by the PTA and Dr. Jarman. Special thanks goes to Becky Lupton, Bou Kilgore, Logan Kilgore, Summer Brog, Jim Burns and Diane McCalmont for helping with set up and clean up. Also thanks to Andy Grzeskowiak and Siuslaw Middle School for use of their facility. If you would like to be a part of next year’s fair, please call Alice at 541-997-5454. Check out the Florence PTA’s new website at florencepta.org! The Florence Community PTA is proud to announce its 2013 Siuslaw High School Senior Scholarship recipients. Scholarships were awarded at the annual high school Scholarship Award Night on May 30th. Normally the PTA awards two $500.00 scholarships to local graduating seniors (Siuslaw High School or home-schooled in Florence). First priority is given to students intending to pursue a career in teaching. Due to the increased collection and earnings from the General Mills Box Tops campaigns at the elementary and middle schools during the 2012-2013 school year, PTA voted to award four scholarships this year. Scholarships were awarded to Alexandra Dodson, Alexandra Thielen, Lona Dengler, and Annaliese Henry. Congratulations to these four young ladies! While the Florence Community PTA had a captive audience at the March 14th Talent Show, it honored Safeway for their commitment to education by making a presentation to Chad Dickson, Manager of the Florence Safeway Store. “It’s important for our PTA and the Siuslaw schools to recognize and thank Safeway for caring about our community and supporting education in Florence,” said Diane McCalmont, PTA’s eScrip Coordinator. PTA presented Mr. Dickson with a thank you banner for display in the local store, and a letter of appreciation. In the school year 2011-12, Safeway contributed nearly $12,000 through the eScrip program to the local PTA. The local PTA has been able to fund grants for supplies, equipment, and programs in the Siuslaw schools, and without Safeway’s support, many of these items and programs would not become a reality in our schools.